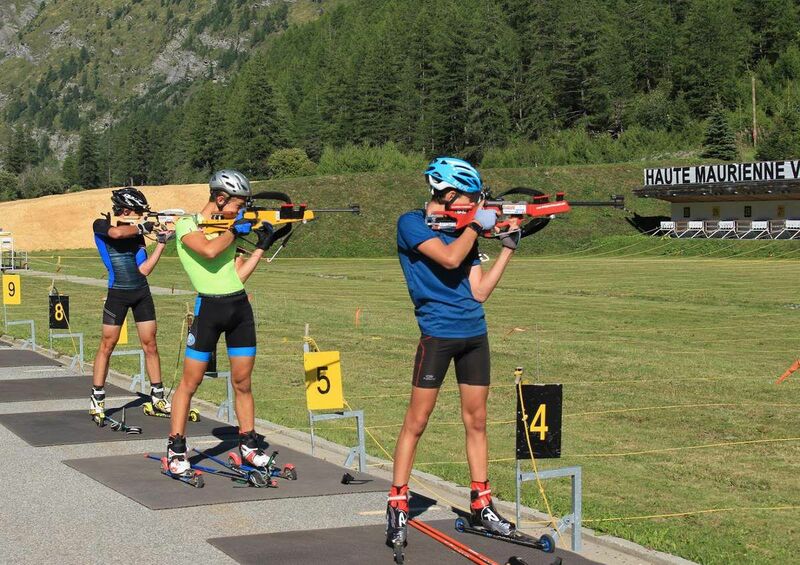 I mentioned a few weeks ago that I was going to do a Biathlon "stage" with Marie Dorin and Lois Habert. I've got round to writing up my experiences. It was an interesting 3 days and brought home just how good the biathlon stars are. Biathlon is the Number One winter sport in Europe and its popularity is increasing. Scottish biathlete and Eurosport commentator Mike Dixon says that between 100,000 and 300,000 Brits tune in to their coverage. It is easy to understand the popularity. Lycra clad gods and goddesses gliding around pristine snow covered forests and pastures, reaching speeds of up to 70km/h descents on skinny skis while carrying a 4kg long rifle. A single missed shot means a penalty loop, 150 meters of pain and shame that can turn a race on its head. At the end of August I got the chance to spend 3 days training with current Olympic relay gold medalist Marie-Dorin and her husband Lois Habert (a European champion) at Correncon en Vecors. Marie has now retired and is expecting her second child in the New year. Obviously in August we were not on skis but on roller-skis. Thanks, a fun read. It must have been a great experience to try real biathlon in proper settings with proper equipment (can't believe championship weapons are being let out like that), and good prone shooting, seems you have the hang of this. I bet watching races in the winter will be much more interesting than before now that you know the tactics and felt the competition nerves etc. I guess you are start number 8 in the video? With the beard? But must say a bit weird to see a champion like Marie doing beginner classes. Seems a waste of resources. She can do what she wants of course, but helping advanced or elites would seem more appropriate. Also a shame for a champion like her not to be better off after a great career considering all the money in such a popular sport. Maybe she should start a clothing line like so many others. Baggy shorts etc, lol. The guy with the beard is called Amaury, he's very good. He's cross countried in the past but only just started rollerskiing, but he's very athletic. I read this a while ago and never commented. I think this is probably the best post EVER in this group. Thanks for posting. Also, you posted photos. That almost never happens. ...I note that biathlon is the most popular winter sport TO WATCH ON TV. The doing-of-it is not common at all. Probably just-plain-XC is the most popular winter activity -- done by the most. However, biathlon is awesome to do -- with whatever marksmanship tool you might have available. We use BB-guns and pop-cans in our backyard. More should try it! trotro wrote: The guy with the beard is called Amaury, he's very good. He's cross countried in the past but only just started rollerskiing, but he's very athletic. Then you must be the other guy with the Nordeex skis. Yes, that's me with the bad rollerskiing style. I've been working on it since but I'm not that dynamic - afraid of falling on hard tarmac. The best thing I did this autumn was spend an afternoon at another rollerski center on my own just trundling around. Today did a classic for the first time and am completely dead, wondering how I'm going to drag myself into work tomorrow. It is like running for the first time. It's not bad at all the little I can see of it. I don't have any style to be able to give advice, but noticed becoming much freer after I started wearing protective gear like knee and elbow pads so maybe something to consider. If I was a beginner again, I would even use hip protection and helmet with face protection like mountain bikers use. Especially the face protection as I'm still so scared to plant the pole between the legs and go face first in the asphalt that the pole plant is delayed and that's obviously bad. The times I've fallen was when downhill skills did not match the slope, and the hip took most of the hit. The other time was due to stupidly planting the pole between two wooden planks on a boardwalk, and then it was obviously the arm being twister (stuck in the wrist strap), but again the hip got scraped.